I think it's Brawler (Devoted / Helwalker) with who weapons in each hand. I guess it doesn't really matter what you will focus on if you maintain instacasting Swift Strikes and Disciplined Barrage. Maybe some multi classes with monk / priest could be good too, but so far I like Brawler a lot. Edited by AndreaColombo, 21 November 2017 - 12:29 AM. This one is pretty good. Uses disciplined strikes + swift flurry. Surely destined for the nerf bat though. It's just under effects of Swift Strikes and Disciplined Barrage. Edited by Nail, 21 November 2017 - 01:17 AM. Yeah both Disciplined Barrage and Swift Strike/Lightning Strike is super powerful atm. They are instantly casted and cost only 1 source point. Pluse Devoted is OP due to the current penetration system. Strong combo build for sure. But it also depends on your difficulty, in Potd all enemies has +15 defense which makes it harder to do critical attack. So the effect of swift strike is not that impressive. You might need to pick Lightning Strike instead in Potd. Edited by dunehunter, 21 November 2017 - 01:16 AM. You mean MIGHT NOT STRENGTH. That build sounds highly effective though. Still this build does do what I like swings weapons with elemental damage. So assuming casting rate is still garbage I will probably build this first. I like to use Shattered Pillar instead of Hel Walker. 1.) 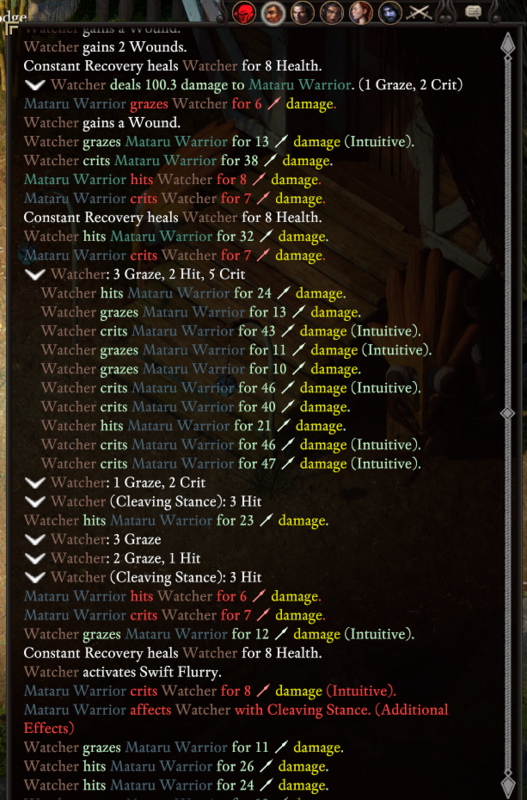 Much more tanky as you gain 'wounds' by doing damage instead of taking damage. The Monk attacks are all Primary not Full so using a shield has no downside. 2.) No reason to stat dump and have a bad Will defense that just screams please charm me. Edited by dunehunter, 21 November 2017 - 01:47 AM. Well if you play on PotD there's nothing called high deflection, every mob has much higher accuracy and deflection. Thinking about this build for solo walkthrough, so charm is not a big problem. Also there are some defense perks to cover that will loss. Maybe Wood Elf would be better option too, during immune to Petrify / Paralyze, what I evaluate much more dangerous than Enfeebled. Edited by Nail, 21 November 2017 - 01:48 AM. Great build, and I love that you picked a mountain dwarf. I'm playing one right now, and enjoy it immensely it. 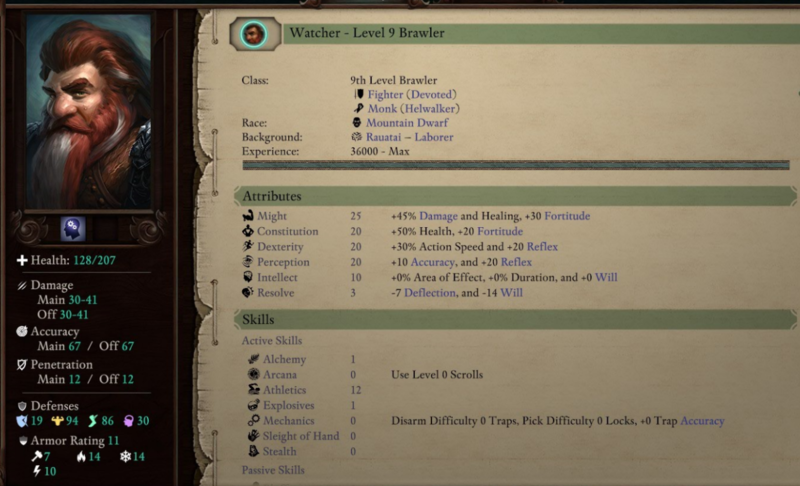 Perhaps, I'll make a mountain dwarf character as my very first one in Deadfire. Its only +15 accuracy, nothing that a superb small shield with weapon and shield style can't negate with +26 deflection. Heck a plain small shield with the style bonus would get you +14. With the removal of grazes you'll get hit less often and pursuing high deflection will be stronger. Add in 70% DR if your armor is high enough and you can tank till the cows come home. Have somebody tried Monk / Priest ? Edited by Nail, 21 November 2017 - 11:55 PM. The ogre's "clubs" don't count as clubs when it comes to proficiency. Ogre + Berserker is nice and so is Ogre + Corpse Eater. Because the stat buffs stack. The only thing is that the grazing gauntlets don't help you and that the INT debuff of the Ogre makes you Carnage area smaller. Berserker also has an INT debuff when frenzied because of confusion and it stacks with the Ogre's so you better max out INT at char creation. Paladin+Berserker is a strong combo because you can take away the confusion once and for all with a passive. Bleak Walker + not confused Berserker sounds nice. The +50% crit conversion could be cool with FoD. I also tried Devoted/Priest of Berath with the summoned great sword (which is awesome with the +60% corrosive lash at lvl 6 - just takes too long to summon). Too bad I can't try Bleak Walker + Priest of Berath. I also tried Bleak Walker + Lightning Strikes (Shattered Pillar). Very nice spike damage and no shortage of wounds here. Still: Devoted or Assassin + Soul Blade still seems to be one of the most powerful single target destroyers. I mean even when you ignore the bug of Soul Annihilation. 150 raw damage on top of your usual weapon damage (which is already huge) and building up enough focus with one or two attacks, then doing it again is very strong. Edited by Boeroer, 22 November 2017 - 12:13 AM. GoldPact Knight + Tricker, I did this combo today and it seems pretty fun for dueling. Proficiency weapon picked battleaxe + medium shield. Talent picked Brand Enemy + Gouging Strike + Riposte. Soloed Skulking-Terror on PotD barely get touched. Edited by dunehunter, 22 November 2017 - 12:46 AM. Berserker + Devoted makes for a confusion free rage when used in conjunction with Tactical Barrage. 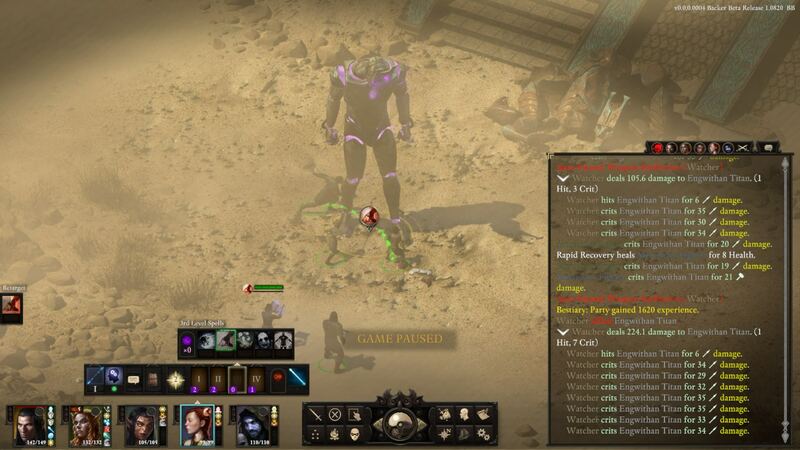 As a bonus the +5 Intellect also makes your carnage bigger. An extra 7 penetration when raging with 50% hit to crit is stupidly good. Unbroken + Shieldbearer Paladin with spear and shield in Defender stance gets SIX engagements that if broken get a +10 penetration counterstrike. I need to experiment more but this guy could be the line holder. I pray a usable tank that the mobs dont go around praise the Gods.